Los Angeles Railway car no. 60 on D Line service waits in traffic for the signal change adjacent to the Monarch Hotel. This Bunker Hill scene is now completely gone, thanks to the redevelopment of the 1960s and ’70s, which destroyed the Bunker Hill neighborhood. Learn more about the Monarch at the On Bunker Hill website here. This photo intrigued me because I must have seen this scene when I was very young. I did some research to determine the location and found it was at 5th and Figueroa. Mt guess was that the photo was taken about 1945 or 1946. 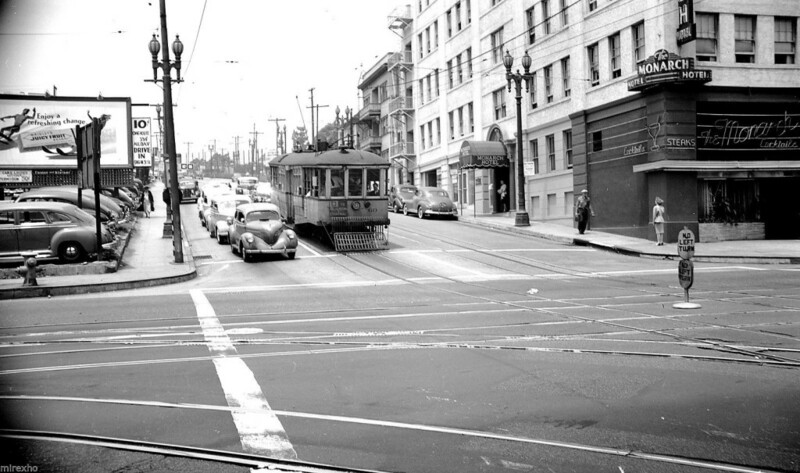 The track crossing 5th Street was Pacific Electric, their Arcade Station – Edendale line, where passenger service was moved to Subway Terminal in 1940. I don’t know if PE continued to use this track for extra moves such as box motors or to move cars from the Glendale Lines to 6th & Main station, but it looks as though it could still have been used when this photo was taken.